Univercoelum and Spiritual Philosopher, The. 1/1, December 4, 1847-4/5, June 30, 1849. 16 pp. numbered sequentially through each volume, 13 x 9. $2.00 a year. Absorbed the Christian Rationalist in 1848, and the following year it was itself combined which the Fourierist journal The Harbinger to form the Spirit of the Age. The name is one coined by A.J. Davis in his The Principles of Nature, Her Divine Revelations, and a Voice to Mankind (1847), apparently based on Swedenborg's "universum coelum." The journal was started by the circle that had been formed to take down and propagate the revelations of Davis and featured his work as well as that of Rev. William Fishbough ("the Scribe"), Thomas Lake Harris, ("the Poet"), W. M. Fernald, J.K. Ingalls, and Fanny Green. The object of the publication was the modest one of "the establishment of a universal system of truth, the reform and the reorganization of society," but it combined within this broad framework a congeries of disparate and ill-fitting elements: Davis's lectures and medical nostrums; romance novels; theological tracts addressed to Swedenborgians and Universalists; and articles by L. Maria Child, Ralph Waldo Emerson, George Lippard, and Harriet Martineau. The journal was so replete with the utopian socialism of Charles Fourier that the editor at one point had to reject explicitly the claim that articles were plagiarized from Fourier. 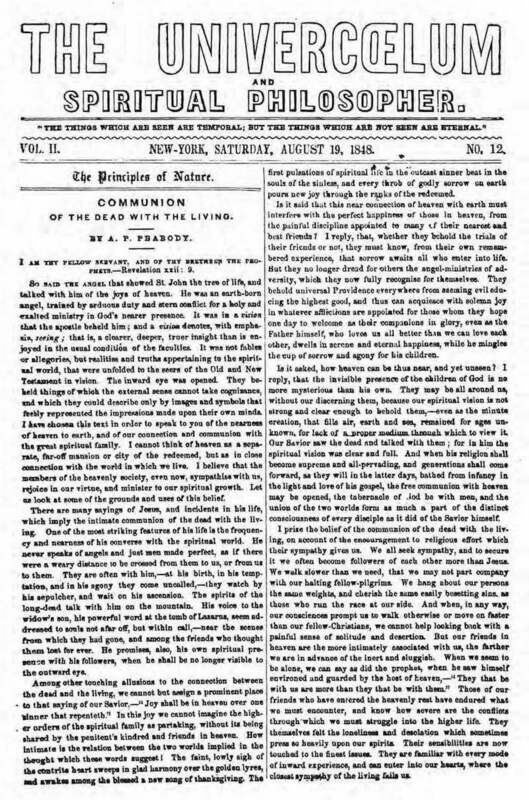 Though every history of spiritualism begins with Andrew Jackson Davis and gives a mandatory nod to The Univercoelum, the journal itself reveals little connection to spiritualism, devoting only an occasional theoretical article to communion with the dead, and mentioning the Fox Sisters' phenomena only once ("Strange Manifestations," February 3, 1849), promising solemnly to investigate to see if they were "spiritual" rather than merely magnetic phenomena. The journal began to dissolve when Davis, who, like Fanny Green and others was boarding impecuniously at Brittan's house in New York, was accused of having spent the night in the house with the woman who had financed the publication of The Principles of Nature and had contributed the most toward starting The Univercoeum. Davis ceased writing for the journal, though he later patched things up with Brittan, Harris and Fishbough and again took up his pen, but the charm was gone and Brittan was replaced as editor by "An Association" with the issue of December 2, 1848, and the journal ceased the following June. At its height, after the first year of publication, the journal had a subscription list of 2,700-though only a fraction paid. Like so many journals before and after, the pages of The Univercoelum' during its last months were given over to filler and "items of interest" from the general press. In the summer and fall of 1849, John P. Cornell, the "chief proprietor" (i.e., creditor) of the journal arranged to transfer the editorial control to the Christian Socialist William Henry Channing, who changed the name to Spirit of the Age. Frances ("Fanny") Harriet Whipple Green (1805-1878), one of the editors, epitomizes the "reform" element in early American spiritualism. Born in Rhode Island, she was a poet, free-thinker, abolitionist, novelist, labor leader, revolutionary, and women's advocate. To relieve her poverty (a consequence of her father's business failure), she published The Memoirs of Elleanor Eldridge (1838), the story of a free-black maid (it sold 30,000 copies). In the "Dorr Rebellion" in Rhode Island in 1842, she sided, of course, with the rebels seeking wider suffrage, and fled into "exile" in Connecticut. There, she divorced Green, her poet husband, and turned to New York where she supported herself by writing and teaching Biology. She had earlier edited her own journal, The Original, in Providence, Rhode Island, and then in New York assisted in editing The Univercoelum and then Brittan's Young People's Journal of Science, Literature and Art and American People's Journal of Science, Literature and Art. She later edited The Spirit Messenger and its successors and The Journal of Progress, and later still The Golden Gate. Joshua K. Ingalls (1816- ) whose work appears here and in The Spirit Messenger, The Journal of Progress,The Spiritual Age, The Reformer, the Spirit of the Age, and many other spiritualist journals was another universal reformer: Quaker (then Universalist minister), Temperance advocate, food faddist (Sylvester Graham's crackers), abolitionist, radical economist (the labor-theory of value), and most consistently, land-reform anarchist and advocate of individual sovereignty. NY Historical Society, NYPL microfilm; LOC."